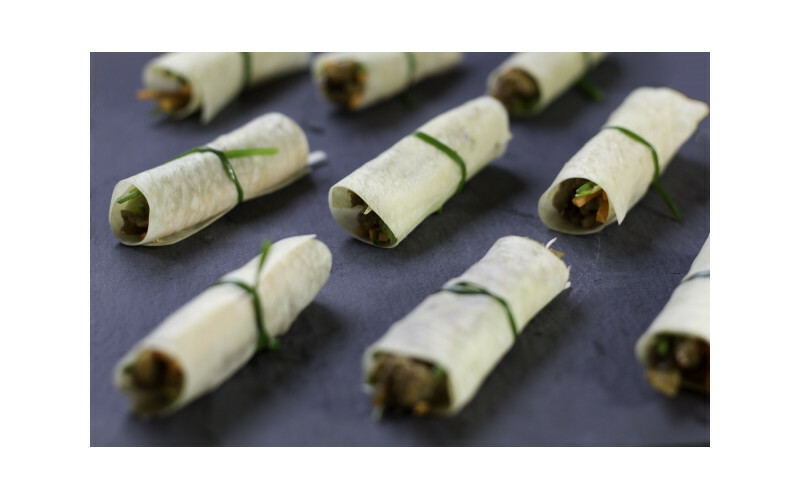 Mock Duck spring rolls from the lovely Fry's! The home-made plum sauce recipe is delicious and easy to make, but if you are very short of time, cheat with a ready-made version such as Blue Dragon. Thanks to Vegan Peasant Catering who created the recipe and photo for Fry's. 1. Make the plum sauce by draining plums and keeping ½ cup of plum syrup. Remove stones from plums and place the fruit into a saucepan with remaining ingredients plus the 1/2 cup of reserved syrup . Bring to the boil, stirring occasionally; reduce heat and simmer 10 minutes or until thick and syrupy. Push through a sieve into a cleaned saucepan. Return to the boil, simmer until thickened as desired. Keep warm while you cook the rest of the dish. 2. While the sauce is simmering, cook the Chunky Strips according to packet instructions and slice into thinner strips. 3. Steam the pancakes or microwave them until hot. If microwaving, wrap in kitchen paper and microwave for half a minute on hot. Test to make sure they are hot enough and heat for a few seconds more if necessary. 4. Arrange the mock duck in the pancakes then add the spring onions and cucumber. Roll each wrap up. Serve with the plum sauce.